Where did that ingredient really come from? We look at a lot of menus here at simpleERB HQ. Sometimes it’s because we’re hungry, sometimes it’s because we’re interested in what our users serve in their restaurants, mostly it’s because we like good food. Looking at menus, you quite often get a feel for what trends are doing the rounds but one thing that we’ve seen more than anything else over the last few years, are menus telling you exactly where your food came from. This is no bad thing. In a society where we are much more informed about the world we live and eat in, it’s good to know the name of the farmer who supplied your asparagus or the farm which provided the Aberdeen Angus steak. Do we really know where the actual ingredient came from in the first place though? We know that the radish on your plate (yes, THAT actual radish) came from a producer in nearby Gascony but was the radish always indigenous to this region? Did someone bring it from somewhere else? Have the Italians always had an affinity with the tomato, or did they come from South America? Luckily, people much smarter than us, have created an interactive map showing the origins of many of our favourite foods so we can now while away the hours looking at yet another map whilst being amazed that we hadn’t heard of the cow pea until now! 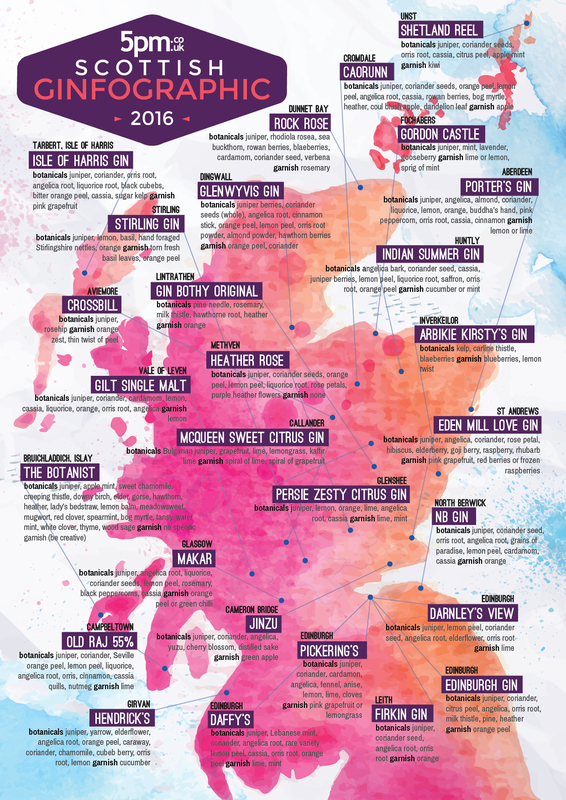 The clever creatives over at our sister company 5pm.co.uk have recently released this ginfographic, celebrating the many gins of Scotland. Gin has increased massively in popularity over the past couple of years so it’s no surprise to see the gin map of Scotland looking particularly full with distillers popping up in every corner of the country. We don’t get a huge amount of sunshine here at simpleERB HQ in Scotland but over the last few weeks the office thermometer has soared and we’ve noticed restaurants nearby setting tables up outside wherever they can. We thought we’d give you a quick how to guide on how to set up another restaurant area in simpleERB. The locals have been lapping up the sun with a bit of al fresco dining and it got us thinking, maybe some of the simpleERB restaurants have outdoor dining areas which they only use for a small part of the year. When you initially set up your simpleERB account you’ll add areas which will then allow you to add tables to them on your table layout. We know that some of our users leave out their outdoor terrace or seating area because of the rain in Berlin, or the snow in Tallinn but you can add these areas and close them off whenever you aren’t using them. Once your area is set up, you can go to the area settings which is within simpleERB’s advanced settings, and close out any dates you don’t want bookings on those tables. If you don’t want bookings to be taken online at all for these tables, you can click the no web booking button next to the tables when you are setting them up initially in table layout or tailor your web booking availability in your web widget settings, also under the advanced simpleERB settings. This leaves you to manually assign the bookings to outdoor tables as they come in and saves you the hassle of keeping track of a different area outwith simpleERB. This method can also be used for adding bookings who are ‘sitting at the bar‘ during busy times at the restaurant. You may not want let people book these tables, but you might want to have the area and the option to place people there, to maximise your availability. As always, if you have any questions, just drop us an email on help@simpleerb.com. And as our sunshine fades away here in Glasgow, feel free to send some warm weather our way too! We’ve quite enjoyed reading the storm in a teacup that the now infamous deconstructed flat white in Melbourne has created. Of course, foodies and non-foodies alike have always had strong opinions about the presentation of food, or drink in this case. Whether it’s the ‘We want real plates’ campaign against food being served on slates or chopping boards or the recent Masterchef cheesecake debate, everyone has got an opinion on the right or wrong way that things should be done. However, was the ‘hipster’ flat white any different than the French serving steamed milk in a separate container when you order a cafe au lait? Was the issue maybe more that it looked like a science experiment? What’s the most bizarre deconstructed meal that you’ve seen? Do you like serving deconstructed dishes?